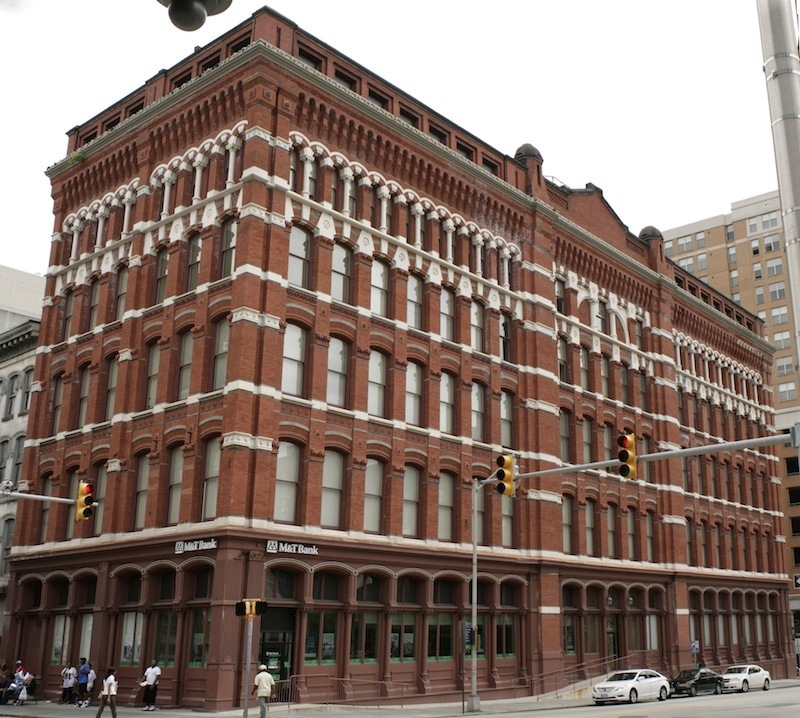 Erected in 1879 as an investment property for Arunah Shepherdson Abell, founder of The Baltimore Sun, the Abell Building was designed by famed Baltimore architect George Frederick—architect for Baltimore's City Hall, Hollins Market, and the Old Baltimore City College. 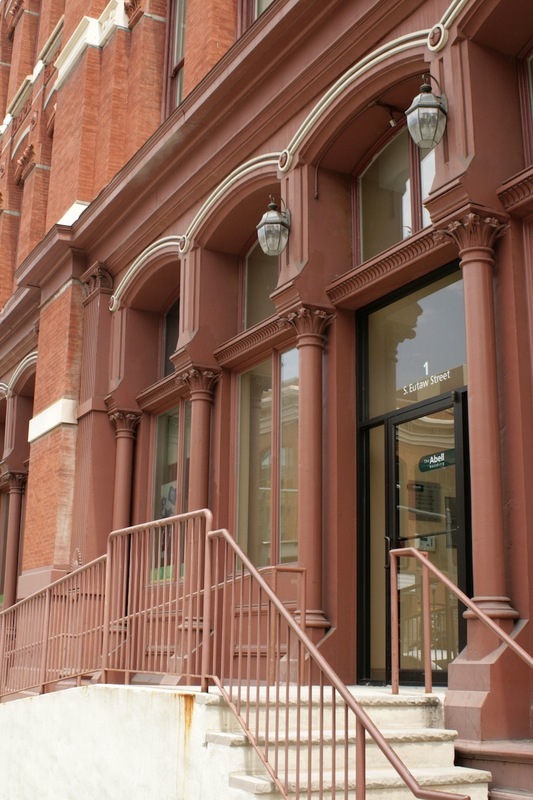 Abell spared no expense in constructing the cast-iron framed, masonry façade building and worked to ensure that tenants included multiple, prominent businesses. 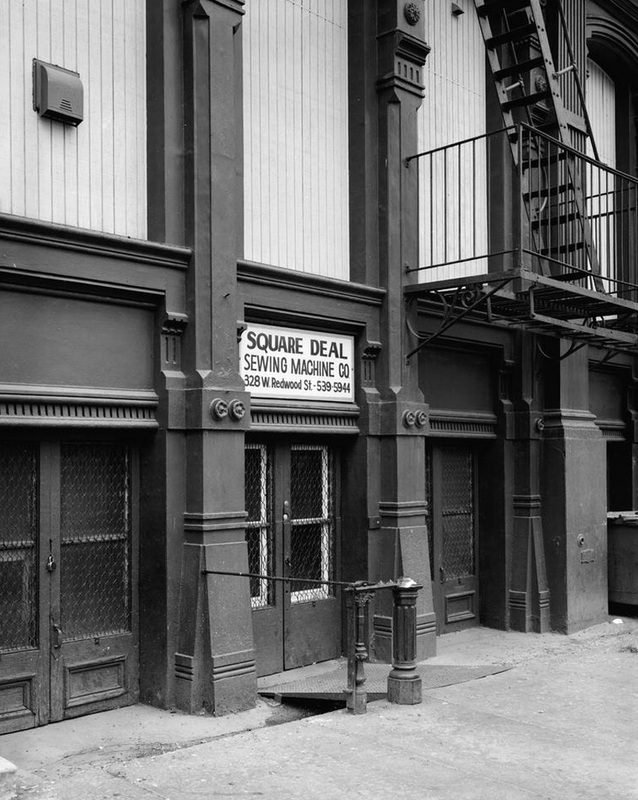 Though the building quickly became known for its lavish construction, its ornate exterior belied the hard reality that workers within its walls faced. The corner of West Baltimore and Eutaw Streets made an ideal location for local industry along a main streetcar line, just a few blocks from a B&O Railroad station and close to the Baltimore harbor. The grandeur of the building's construction, its two hydraulic elevators, and its imposing size invited immediate recognition and praise in local and national publications. In late nineteenth century Baltimore, as across the country, most skilled professions had declined as craftsmen were replaced by machines that could produce more goods more quickly. Wages for the masses of largely immigrant, unskilled workers who came to cities like Baltimore seeking work in industries remained low and working conditions were unregulated and woefully unsafe. One of the industries that attracted thousands of workers to Baltimore was the clothing or needle trade. In the years following the Civil War, demand for ready-to-wear garments skyrocketed and Baltimore's garment district boomed in response. 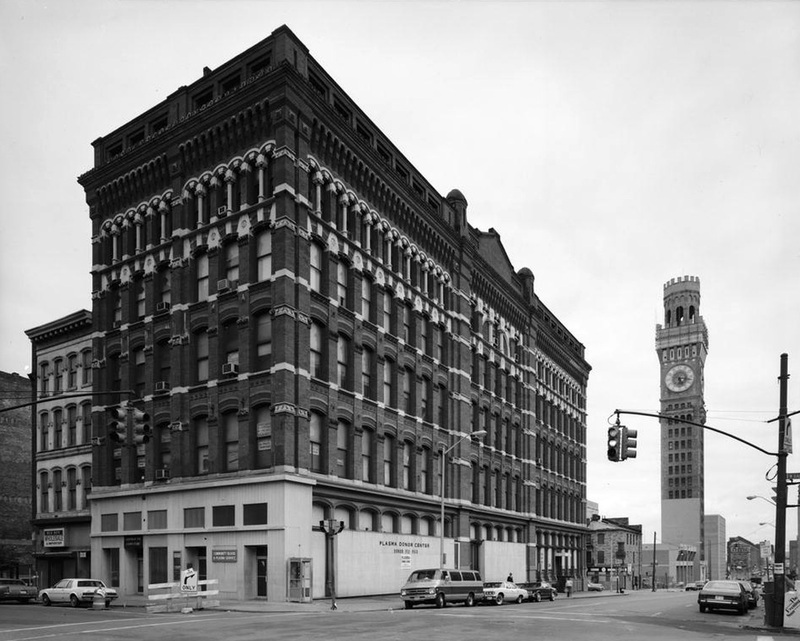 Strouse Brothers, one of Baltimore's largest clothing manufacturers operated out of this building in the late nineteenth century and was a prominent player in Baltimore's growing needle trade. Strouse ran what was then called an "inside shop"—a multistory factory outfitted with new machines and the latest in manufacturing technology—where workers (largely women) worked long hours to keep the factory's machines running, often earning barely enough to survive. While larger clothing manufacturers escaped the criticism directed to sweatshops by local reformers, producers like Strouse, even when unionized (the United Garment Workers organized in Baltimore in the 1890s), often sent piecework out to sweated workers in small shops or set up their own small, outside sweatshops to avoid paying higher wages or complying with worker demands for better conditions and shorter hours. When the clothing industry slumped after WWI, many of the gains achieved by Baltimore's garment unions eroded as the pursuit of ever-shrinking profits led many manufacturers to once again increase their reliance on sweatshops. Despite the fact that union strikes eventually brought new gains, Baltimore's once thriving garment trade was in sharp decline by the 1930s. Though there are still a small number of women sewing coats and uniforms in various downtown clothing shops, Baltimore's days as a center of ready-to-wear garment production are long gone. Luckily, this handsome brick building weathered the decline of the garment industry and years of neglect. PMC property group acquired the building in 2005 and it now houses well-appointed apartments that feature high ceilings, large windows, and a bit of Baltimore history. Tarin Rudloff and Theresa Donnelly, “A.S. 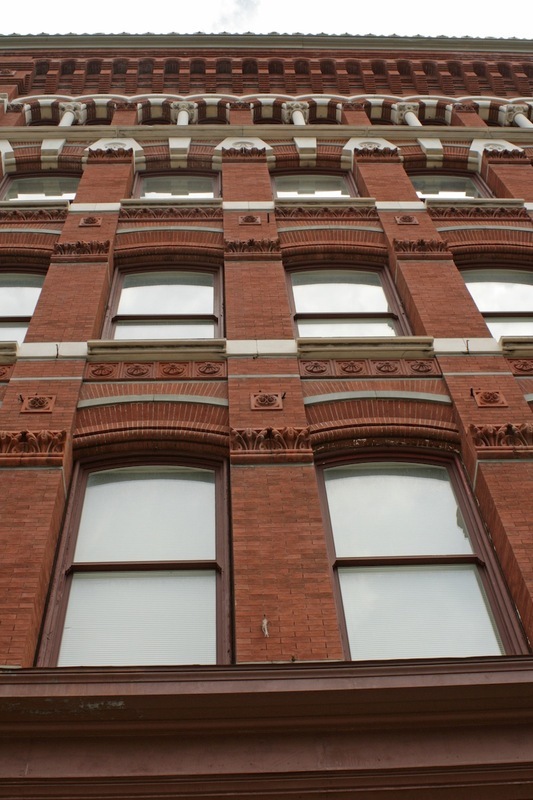 Abell Building,” Explore Baltimore Heritage, accessed April 19, 2019, https://explore.baltimoreheritage.org/items/show/109.